I was helping a friend kill bedbugs on their beds and floors. I was interested in doing so because I got my share of feeding them unintentional (what I mean is: they bit me too, and it was not a good one), so I'm taking my revenge. We actually used a kerosene to kill it, others died but the rest just try to play dead when we sprayed the chemical and some just simply hid themselves. Vacuuming. 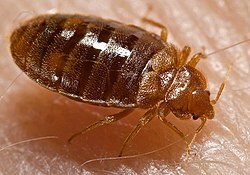 A thorough vacuuming of cracks and crevices can physically remove bedbugs from an area. But vacuum cleaners can't reach all hiding places. Hot water. Washing clothes and other items in water at least 120 F (49 C) can kill bedbugs. Clothes dryer. Placing wet or dry items in a clothes dryer set at medium to high heat for 20 minutes will kill bedbugs and their eggs. Enclosed vehicle. If it's summer, you can bag up infested items and leave them in a car parked in the sun with the windows rolled up for a day. The target temperature is at least 120 F (49 C). for a chemical treat please inquire the nearest pest control in your area. sad to see there is no shortcut to get rid of them ugh!